Directions: Preheat oven to 425°. In a large bowl, toss sweet potato wedges with olive oil, garlic powder, cumin, and salt and pepper. Transfer to a well oiled baking sheet and bake for 20 minutes. Flip the potatoes and bake for an additional 10 -15 minutes, until golden brown. 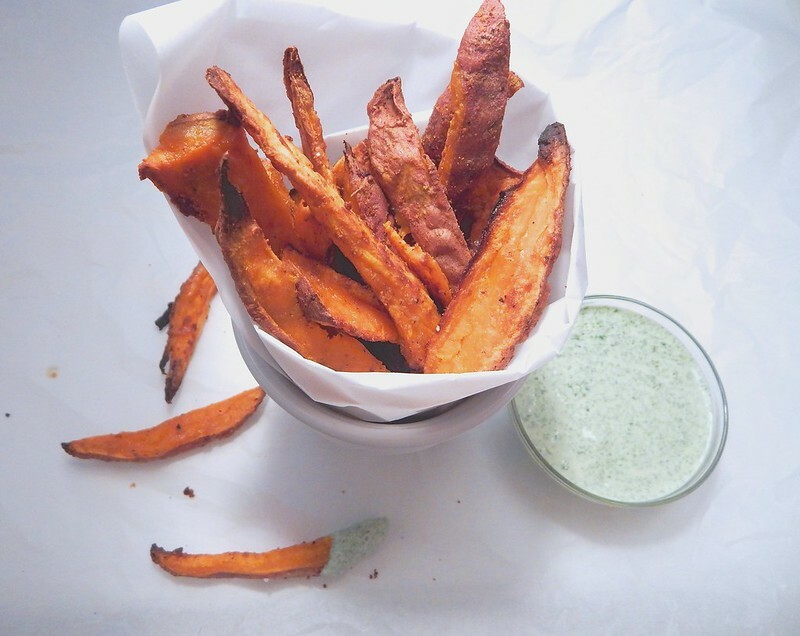 While fries are cooking, make the dipping sauce by combining lime juice and cilantro leaves in a food processor. Pulse until very finely chopped, about 30 seconds. Add the greek yogurt and pulse to mix for about 30 seconds, scraping the sides of the bowl as you go. For extra creaminess, add extra greek yogurt, one tablespoon at a time until desired consistency is reached. Season with salt and pepper to taste.